The panelists (from left): Drs. Alkire, Al-Kiswani, Abu-Ismail, and Dibeh. For decades, societies across the region have been crying out for social justice and economic equality. The issue seems even more acute in this age, prompting experts to ask, can the Middle East endure another generation of declining incomes, rising disparities and persistence of poverty? This question was tackled in a lecture organized earlier this month by the Department of Economics and the United Nations Economic and Social Commission for Western Asia (UNESCWA) on measuring multidimensional poverty in the Middle East. 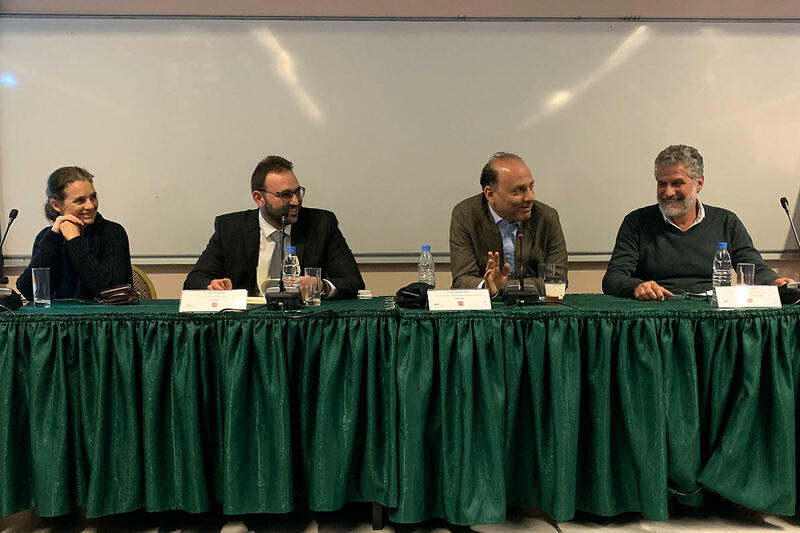 In his opening speech, LAU Professor and Economics Chair Ghassan Dibeh stressed the importance of the poverty and inequality question in Lebanon and the Arab world. First to speak was Professor and Director of the Oxford Poverty & Human Development Initiative Sabina Alkire, who outlined the factual definition of poverty with an emphasis on measuring it globally. Relying on mathematical modeling and formulization, Dr. Alkire explained the difference between the methodology of measurement in a simple versus multidimensional world. The MPI is an assessment of acute poverty covering more than 100 developing countries. It complements traditional income-based poverty measures by capturing the severe deprivations that individuals face with respect to education, health and living standards. Following Dr. Alkire’s presentation, UNESCWA’s Dr. Khalid Abu-Ismail and Dr. Bilal Al-Kiswani addressed the conceptual and policy relevance of the Alkire-Foster Multidimensional Poverty Framework, which Dr. Alkire developed with fellow economist James Foster. Dr. Abu-Ismail, who is UNESCWA’s chief of economic development and poverty, described how the multidimensional poverty measurement concept has come a long way. In turn, Dr. Al-Kiswani, who is first economic affairs officer at UNESCWA, emphasized that more people need to follow this method in analyzing multidimensional poverty. “What we are trying to do with the regional Arab MPI is find a measure closer to the region’s current situation,” he explained. The experts hope that by measuring the specific needs of the region’s poor, they can help authorities outline plans to remedy the problem, bettering countless lives.